Each summer we have children and teenagers from all walks of life come and experience God at High Peak Camp. The Salvation Army is dedicated to touching the lives of our youth. One of the ways we accomplish this is through the summer camps. Each summer we have children and teenagers from all walks of life come and experience God at High Peak Camp. 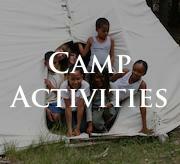 At camp, we offer many daily activities for each child's interests. "I learned that through God's support I can conquer my fears"